When we introduced Dispersa streams availability monitor, we new that people need not only to monitor but also to track the performance of their streams. Bringing proper quality of service for streaming media business requires data for analysis. 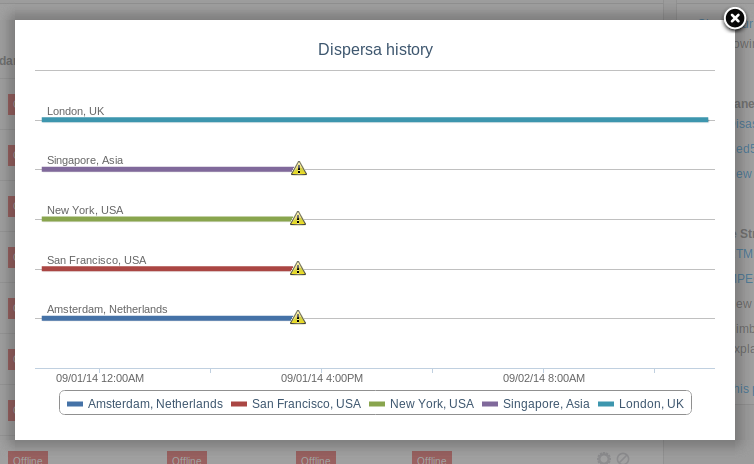 Now Dispersa is able to store the history of check-overs for last 32 days and view it via easy to use chart. Being a premium Dispersa user, you may use Monitoring menu to see streams monitoring panel. Now click on a stream name to view the history. If some transmission wasn't available between some moments time, the chart will show the breakage. Each checkpoint, including private checkpoints, will have its separate history. 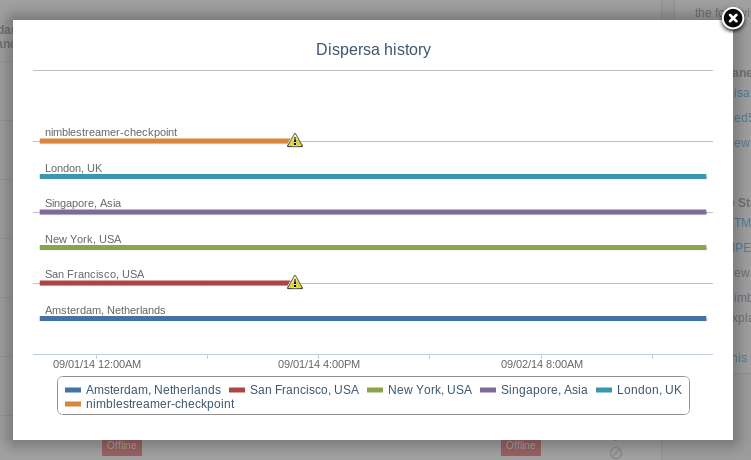 View stream availability history at all checkpoints. View stream monitoring results over time. Stream may be unavailable for certain period of time for some of checkpoints. You may zoom to any time slot within stored period by picking range. Viewing period details for stream monitoring. 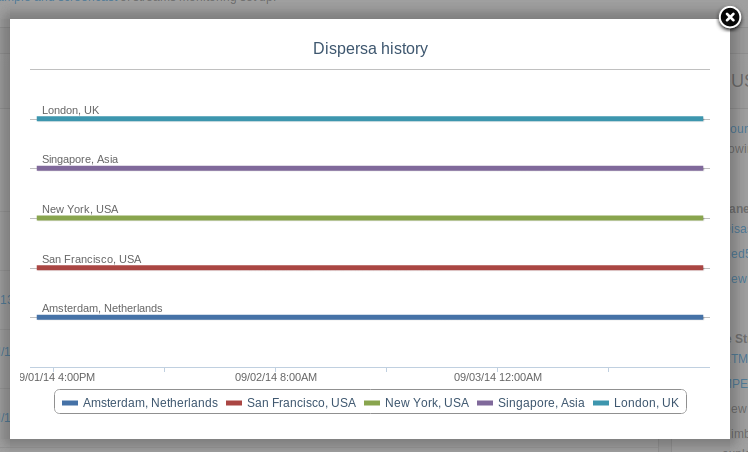 If you'd like to have same statistics within your monitoring or analytic tools, use Dispersa alerts push API to get notified about streams going offline and online. 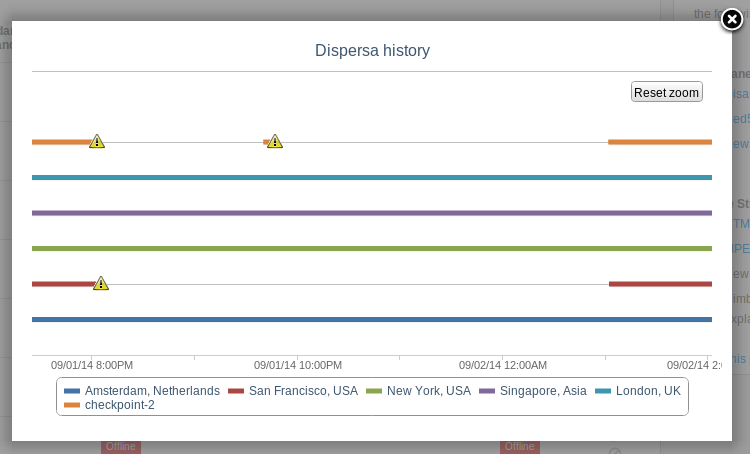 We will extend Dispersa with more QoS-related functionality so if you have any suggestions, just let us know about it. Check other current and future streaming QoS features of Dispersa.